HERE ARE PHOTOS of Saint Mary's of the Barrens Church, in Perryville, Missouri. 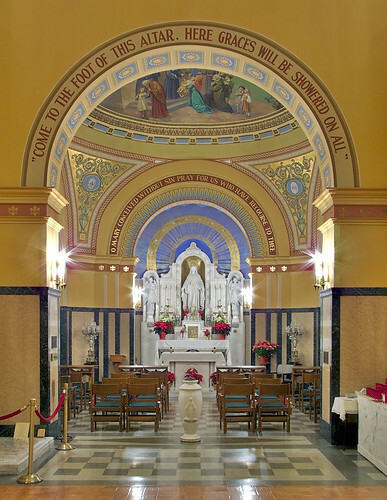 Located in Perry County, this church is home to the National Shrine of the Miraculous Medal. 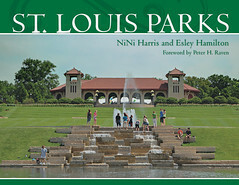 The church is about 81 highway miles south of downtown Saint Louis, Missouri. 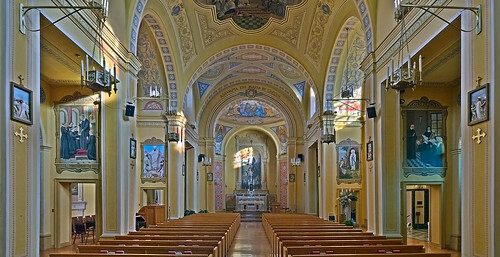 The founding of St. Mary's of the Barrens, Perryville, Missouri, predates the founding of the State of Missouri by two years. In 1818 Father Joseph Rosati and a small group of Vincentian Missionaries were sent from Bardstown, Kentucky, to begin the church here. The first structure built at the time of Father Rosati was a small log cabin which is still preserved under a shelter just south of the Shrine. 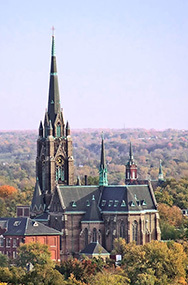 On January 6 The First College, 1827, the foundation stone for the present church was laid, and contributions from Europe helped local efforts to complete and consecrate the structure in October, 1837. In 1823 the seminary received its charter from the Missouri Legislature to confer academic degrees, one of the first such charters issued. 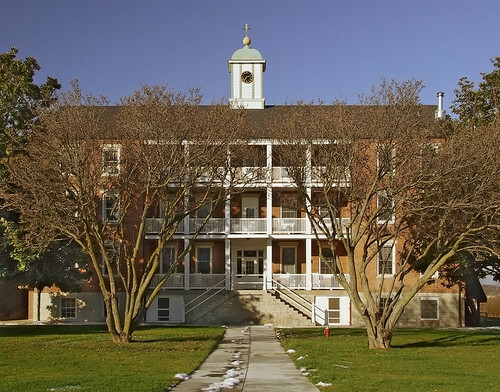 The seminary is the oldest institution of higher learning west of the Mississippi in the United States. It has among its graduates some of the most learned, saintly, and distinguished clergymen in the long history of the American Church, including many pioneer bishops and missionaries. From here went forth the first bishops of St. Louis, Monterey, Pittsburgh, Buffalo, Galveston, New Orleans, and mission areas of China. 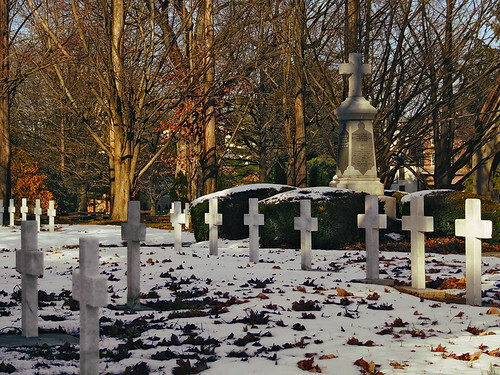 The seminary was closed in 1863 and the students moved to Philadelphia. It was reopened in 1888, and many buildings were gradually added to the campus. The Church itself received a new facade in 1913. The sanctuary was rearranged for Masses facing the people in 1967. It was redecorated several times in its history, most recently in 1980. The church of St. Mary's of the Barrens continued to function as a parish church until 1965 when it became an independent "public church" in which liturgical services are held regularly. St. Mary's of the Barrens is now a part of St. Vincent de Paul parish in Perryville. The Angelus bell tower dates from 1980, and matches the 1913 facade. Both Perryville (founded in 1821) and Perry County (organized in 1820) are named after Commodore Oliver Hazard Perry (1785-1819), the "Hero of Lake Erie"; he was a U.S. Naval officer who served in the War of 1812 against England, and is known for writing "We have met the enemy and they are ours..."
The interior of this pilgrimage church is richly painted. The church seems much larger than it actually is. Perhaps this is because it adapts the design of a much bigger church. 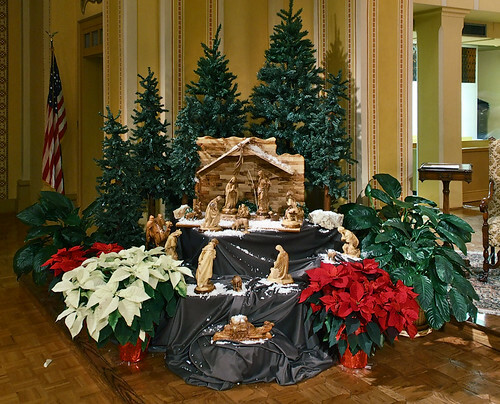 According to a plaque, "The church is a one third scale model of the chapel at Monte Citorio, the Vincentian motherhouse in Rome". 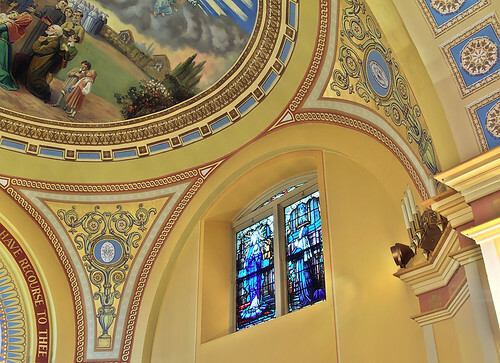 This church has eight side-chapels, including the National Shrine. 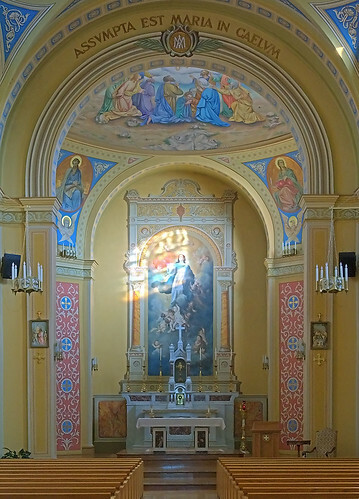 The church has a large sanctuary; on the back wall is a painting of the Assumption. 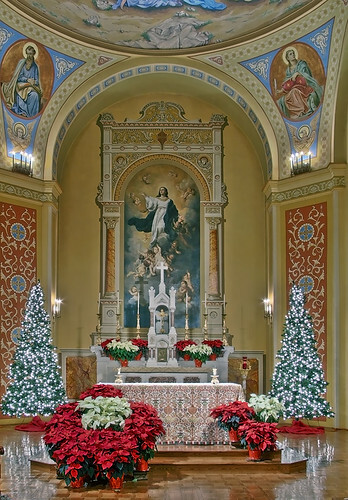 The sanctuary decorated for Christmas. These photos were taken on two separate occasions: once in the daytime during Advent and the other at night during the season of Christmas. 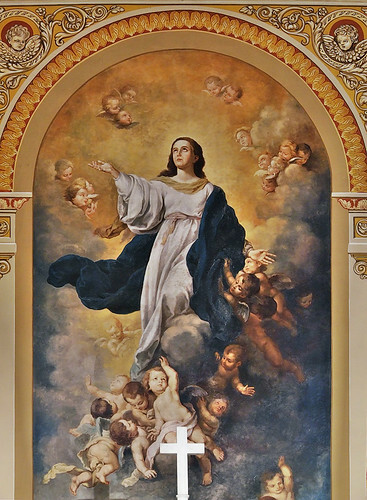 The beautiful painting of the Assumption of the Blessed Virgin Mary. 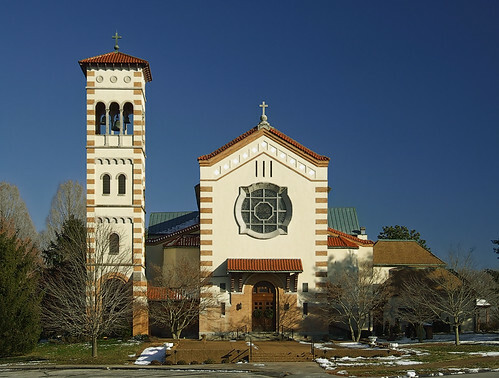 Saint Mary's of the Barrens is not a typical Catholic church name for the Archdiocese, for the earliest parishioners were English-speaking Catholics from Maryland. 'Barrens' is an English word for grasslands; hereabouts we usually use the French name 'prairie'. 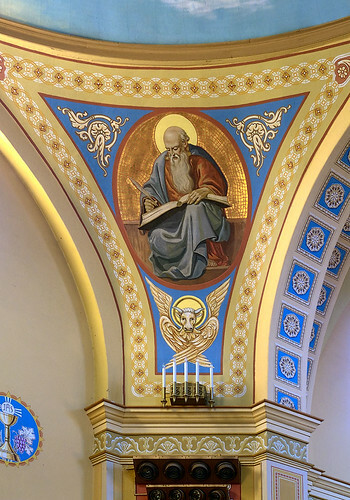 The sanctuary is beneath a dome supported by four columns; above each column is a painting of an Evangelist; here is Saint Luke. 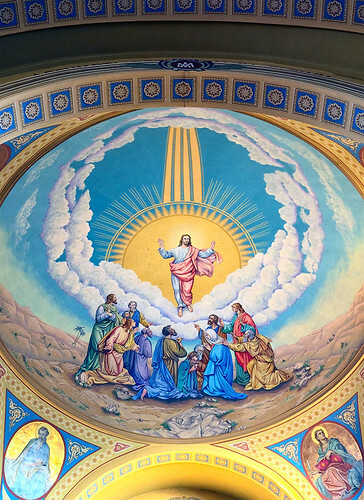 Painting of the Ascension above the sanctuary. 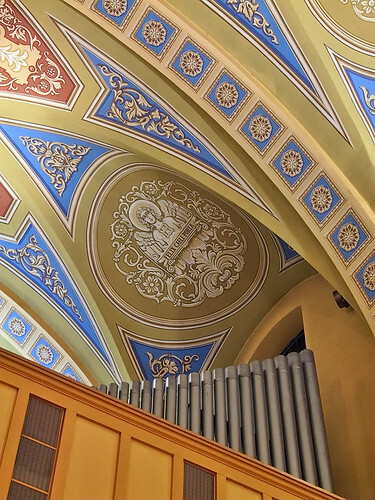 On the barrel-vaulted ceiling of the nave is this painting of Saint Vincent de Paul (1581-1660), founder of the Daughters of Charity and the Congregation of the Mission (also known as the Vincentians or Lazarists). Many of the Saints portrayed in this church, like Saint Vincent, are Parisian. An exterior view of a stained glass window at night. Painting of Bl. 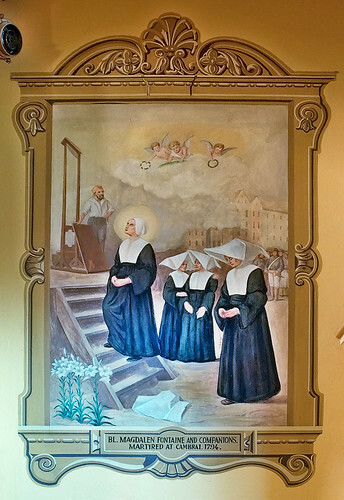 Marie Magdalene Fontaine and her three companions, approaching the guillotine to be martyred. 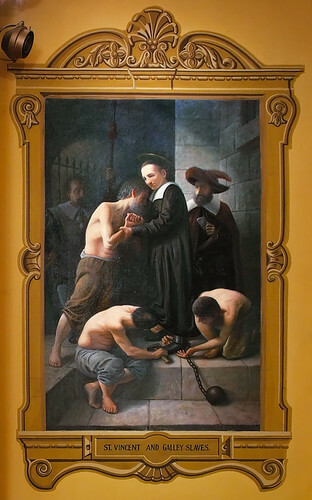 Saint Vincent de Paul ministering to galley slaves. 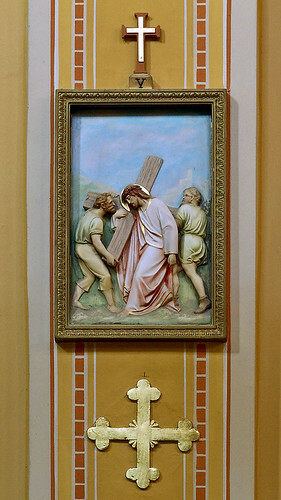 Station of the Cross and one of the church's Consecration Crosses. 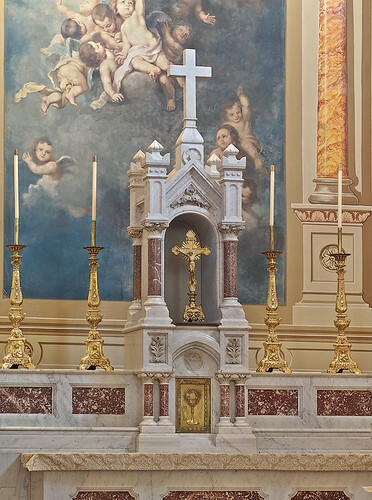 Altar of Saint John Gabriel Perboyre (1802-1840), Vincentian priest and martyr in China. 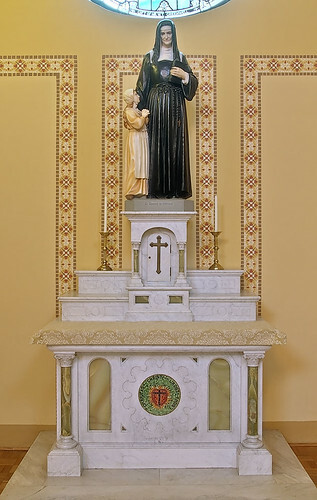 Saint Louise de Marillac (1591-1660), co-founder of the Daughters of Charity, founder of the Sisters of Charity. 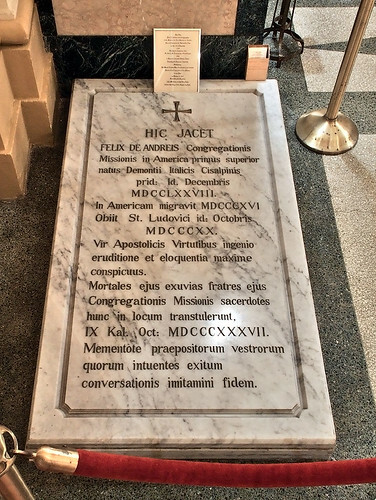 Tomb of the Venerable Felix De Andreis (1778-1820), priest and first Superior of the Congregation of the Mission in the United States. There are a number of other tombs beneath the floor of the church. 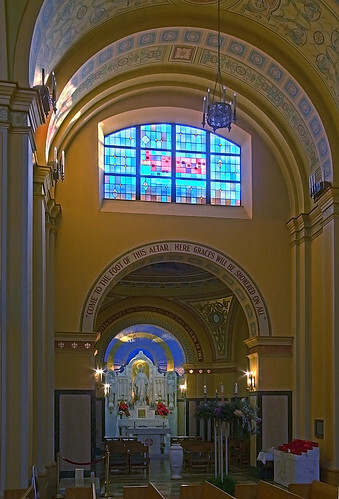 On the side of the nave is the National Shrine to Our Lady of the Miraculous Medal, added to the church in 1929-1930. 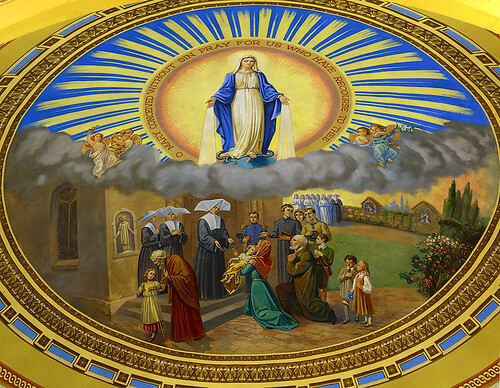 Starting in 1830, Saint Catherine Labouré (1806-1876) had visions of Our Lady, leading to the devotion of the Miraculous Medal. Unusual scene is depicted on the tabernacle door. 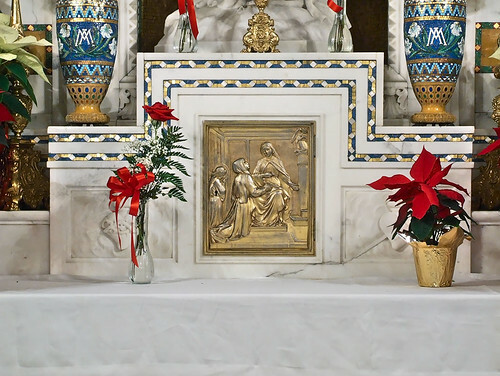 To the left and right are the Sacred Heart and Immaculate Heart. 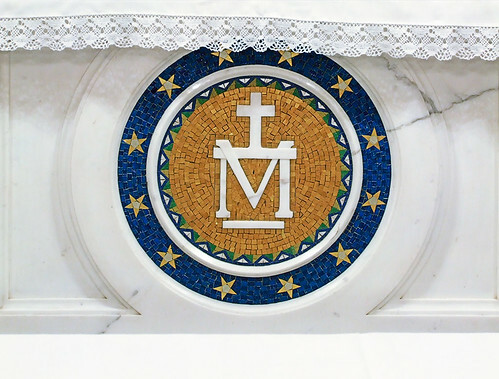 On the front of the altar is Mary's monogram, as shown on the Medal. 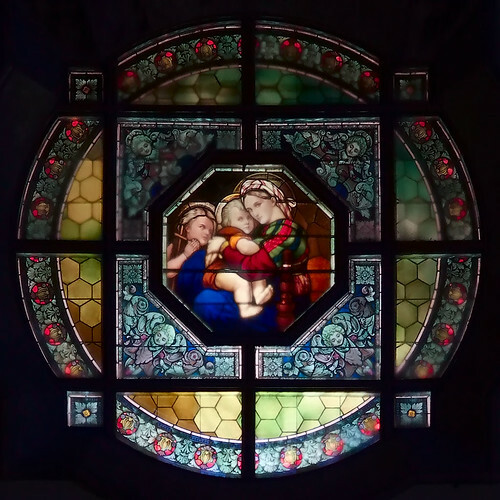 The stained glass windows in the chapel depict Mary's apparitions to Saint Catherine. 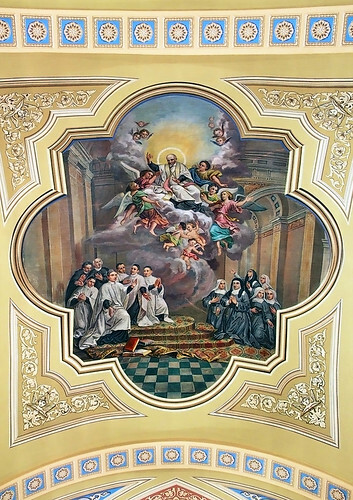 The chapel ceiling has a copy of a painting found at the Mother House of the Daughters of Charity in Paris. The top of the painting shows Mary as she appears on the Medal; below shows Saint Catherine distributing medals to the people of Paris. Adjacent to the shrine is the votive light room, which features tens of thousands of little lights for prayer intentions. 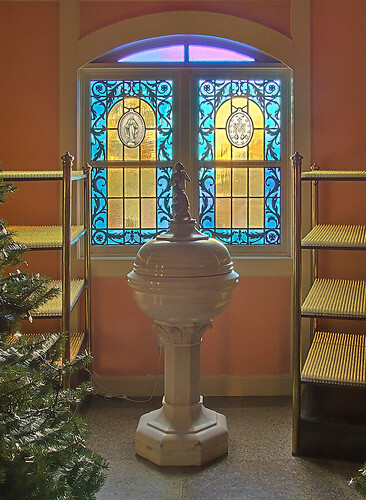 Here is also the baptismal font, and a stained glass window depicting the design of the Miraculous Medal. 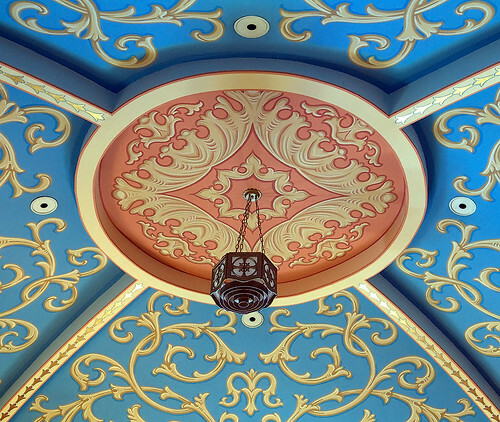 Ceiling above the baptismal font. 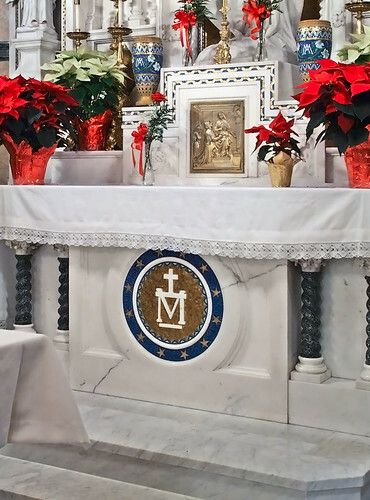 The Grotto of our Lady of the Miraculous Medal was built by the seminarians during World War I. 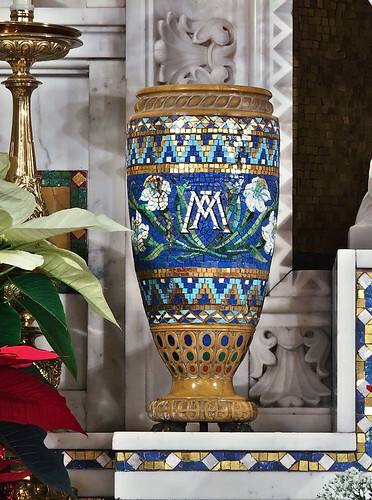 It has become a special center of devotion to our Blessed Mother since then. Construction began in 1917 and was completed in November 1920. 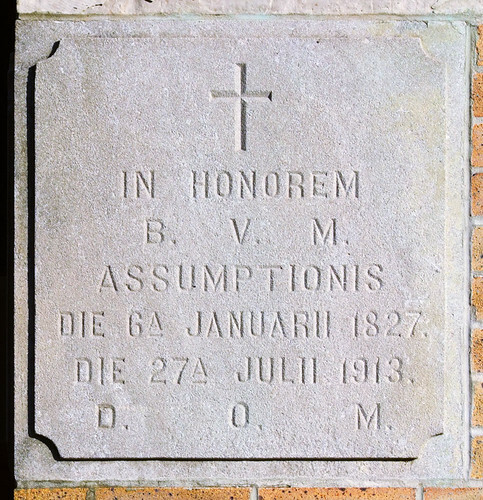 The first stone was put into place on June 25, 1917. 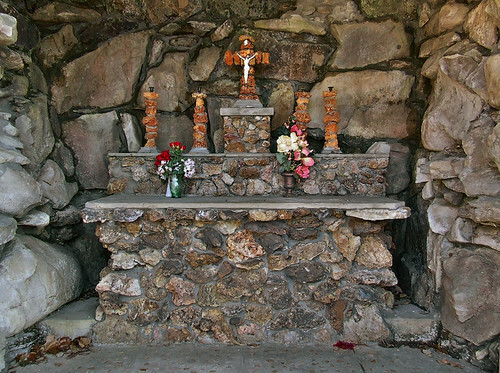 A small chapel recessed in the center of the grotto wall has a small altar made of fieldstone. 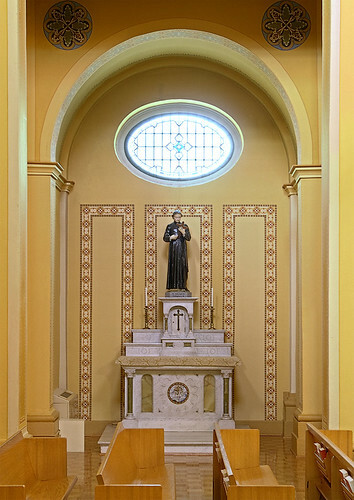 In a small niche at the top of the grotto wall, directly above the small chapel, is a statue of our Lady of the Miraculous Medal. 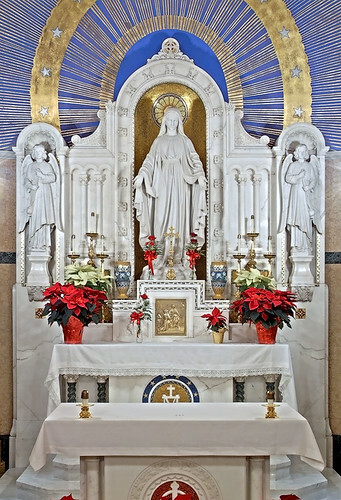 The statue of our Lady arrived August 5, 1920. 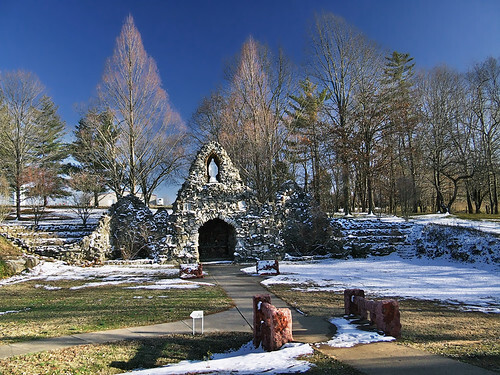 The grotto stands at the site of the old quarry, behind the Mound of our Lady of Victory (originally known as "The Mound of Our Lady of the Fields"). Rock used to build historic Saint Mary's of the Barrens Church came from this site. This is a very beautiful shrine. I am quite disappointed, however, in the votive room. Flickering LEDs really does not give the same sense as real candles. Perhaps we should risk burning the Church down to satisfy your sense of ambiance. Marc, Yes, they should probably take out the l.e.d's.....they aren't suppose to use them, it's better that there are none. Because it is required to be a living flame to be a prayer and it simply confuses people. The Anglican Church uses L.E.D.s and other Protestant Churches because they don't have the theology of the living flame. I'm not quite sure where they are using the LED's as I haven't been there. I guarantee not in the church, you are supposed to have them in there. So yes, there is a reason it doesn't give the "same sense" because l.e.d's have no meaning in the Catholic church. Basically, they're decoration. You can use them in union with real candles to provide ambience, but you cannot replace real candles with l.e.d's, because real candles are blessed and are a Sacramental. And L.E.D. 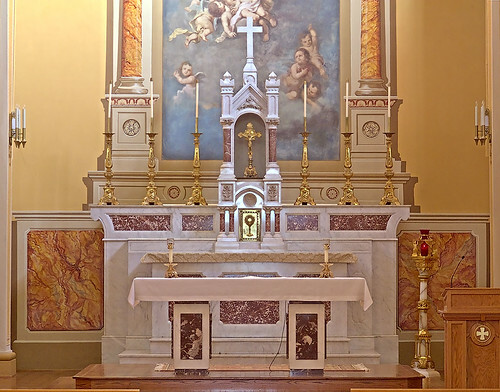 simply cannot be a sacramental. So what you are "sensing" is in fact a subconscious realization of a sacramental. Which is exactly what they are for, to place your heart in the presence of God. 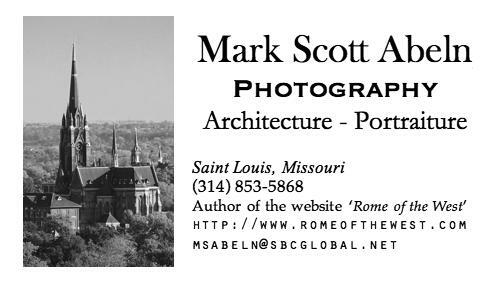 Thanks Mark; these are excellent photos of such beautiful places. You are making me want to go visit all these places! Now that's a church!I particularly love the photo you took ouside at night. . .what image for folks to see as they drive by. 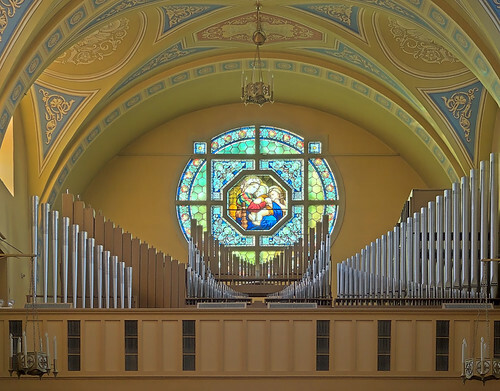 I also love the Pipe Organ. Being a church organist and choir director for many years I find that people often leave the organ out when taking photos. Quite often, the instrument, itself, has a story tell about how it came a particular a church.